North Sails “All in One” wave sail has taken on ‘Super’ status for 2018 and sees only modest refinements from its esteemed predecessor of last year. In effect, the monofilm window has been reduced in size by incorporating x-ply above the lower radial load strip, and overall weight has been reduced further, by optimising the sail’s panel layout. Reassuringly, the key design principles of the 2017 Hero remain – the batten above the boom has been moved up to improve breathability and the sail’s on-off nature (North’s Free.Boomzone.Concept) whilst the sail’s luff curve remains minimal. To counteract any potential loss in stability, the SuperHero incorporates loading tendons radiating from the clew (Radial.Load.Stripes) and a concave-shaped lower leech (Hollow.Lower.Leech) accommodating two large mini-battens. 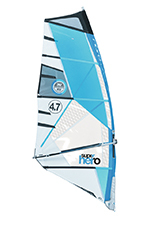 Available in three bright colour combos and an HD (monofilm free) option, the SuperHero comes in thirteen sizes from 3.0 to 6.7m and boasts the use of the brand’s X-Ply.Plus, which, along with their reputed workmanship, gives rise to the impressive offer of 2 + 3 years of warranty available for their sails. One final point worthy of note: the Super Hero comes with a sticker on the sail, stating that the batten tension is already pre-set and doesn’t require adjusting – a unique and interesting notion, giving rise to several questions… Is batten tension so critical that a proud new owner can’t be trusted to apply the correct amount of tension? And will the sailcloth really experience zero stretch over time? Last year the Hero couldn’t help but catch our attention, with its light handling performance and mammoth range, so we are happy to report that the 2018 is similarly conspicuous. It sets with plenty of shape low down in the sail, the large area in the head of the sail loose and twisting as tension is applied. It was rigged here on a Platinum RDM mast and possesses relatively little luff curve, keeping a significant amount of rotation in its battens, the lower one even protruding beyond the leading edge of the mast. Take it onto the water and the SuperHero uses its form to maximum affect, generating an impressive amount of grunt for a 5.0m. With pressure building smoothly in the hands, the sail feels positive and alert, and responds as if electrically shocked when pumped in a gust! It ploughs the energy into the board and jumps it out of the water, making it a master of ‘float and ride’ sessions. Once going, the power delivery is crisp and clean, the sail feeling poised, balanced and ready to respond to the rider’s demands in a snap. It’s an engaging sail to use, the centre of effort low but back in the draft, providing feedback through both hands rather than becoming backhanded. Comfortable and forgiving for cruising in coastal conditions, its not the fastest at cutting a path close to the wind, but is worthy of its ‘super’ name off the wind. It’s as if the deep draft swells further still when skimming over the backs of waves, the sail becoming lighter and lighter in the hands the faster it goes. It makes it a dream to use on a wave, providing the power and flow to put the ball in the rider’s court and let them interpret the ride as they wish. 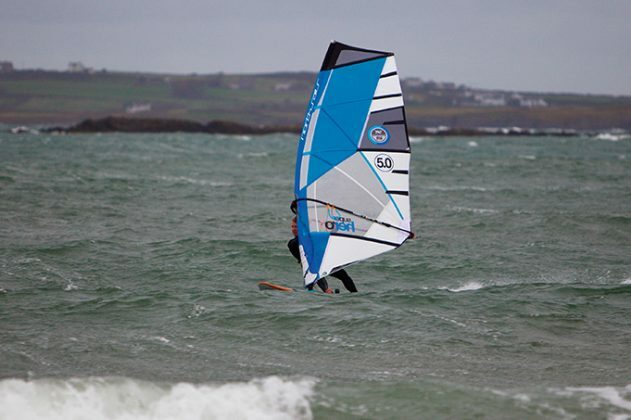 Providing clean, useable power over an awesome wind range, the SuperHero possesses the same magical mix of qualities as its predecessor, championing a truly user-friendly and accessible performance.